The Girl Who Kicked the Hornets’ Nest | Thots and Expressions..
Posted by Afrozy Ara in Book Reviews, Classics. What are the 3 most important factors that would entice you to begin reading a 600+ page novel in the midst of a mindlessly packed office schedule? With these factors lingering in my subliminal consciousness, the Millennium trilogy by Steig Larsson figured at the top of my reading list for this year! This is a series of 3 books with the most riveting titles – “The Girl with the Dragon Tattoo”, “The Girl Who Played with Fire” and “The Girl Who Kicked the Hornets’ Nest”. And, as the names suggest, the stories spin around this girl Lisbeth Salander who is the main protagonist of the series. So, in the 2nd week of Jan, I embarked on mission Millennium. Reading these novels was like a 10 day phase. I used to shuffle to office every morning, worried and wondering what would happen next in the story and come back home longing to dig my hands into the book again. And the author ensured to keep the adrenaline pumping! The books had the intrigue of an Agatha Christie novel, and the brashness of Sidney Sheldon. And Lisbeth Salander is the Lara Croft of Crime fiction!. Quite predictably, the moment Salander was introduced, the plot got me hooked. My naïve first impressions had expected her to be a Charlie’s angels sort of diva. But man, that is not even close! Shockingly different, she is a strong, ruthless yet tragic character. A bizarre anti social anti hero with a crooked smile.. a genius hacker with an eidetic memory.. a fiercely loyal and private weirdo.. You will worry about her, you will want to protect her, but she wont let you feel sorry for her. Wandering the corridors like a stray cat, brazenly spooky, she sometimes seems more of a wiry character from anime series, than a real person! And the way she rises from the dead ( in the 2nd novel ) is … Well, I don’t have the words to describe it!!.. The other major character in the series in Mikael Blomkvist. A finance journalist, he is dedicated to revealing frauds in banking and business. He is a quite opposite Slander’s fiery personality; their queer relationship is what drives most of the story forward. A man of a somehow mild constitution, the way he is treated by his ladies (IMO, like an intelligent puppy : P ) is quite amusing! The underlying theme of all the 3 novels is violence against women. The first novel is intriguing.. The second one is nail biting. The last one is a bit long drawn – with the secret service hocus pocus. But the climax is intensely satisfying. The story is touching, thrilling, shocking and scandalous. .. You will experience the most volatile waves of emotions..Love, hate, loyalty, disgust. All in one go. No guns, no hi tech drama. Just raw emotions. You might not like the books if you are disturbed by immorality and violence (some scenes might be described as grotesque). 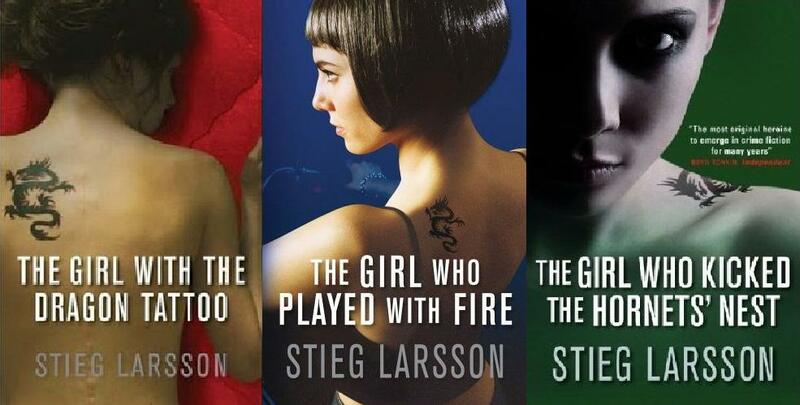 But from the point of crime fiction, it’s an awesome series; and the character of Lisbeth Salander is mind-blowing! The most outrageous and flabbergasting heroine I have ever read (or seen), you have no idea what she is going to do next! What more can I say, this one is indeed a gripping read. A book that will be difficult to forget, long after you have read it! !..